Son of Mr. M. & Ellen Daly (nee Casey), Derryfubble, Moy, Co. Tyrone, Ireland. 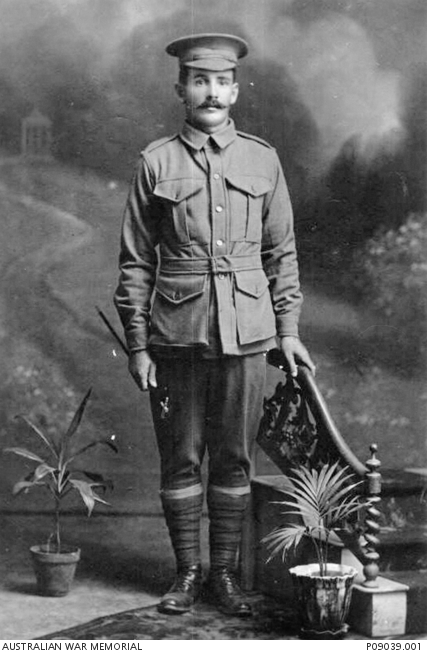 Studio portrait of Private (Pte) James Daly, 7th Battalion, of Melbourne, Vic, who enlisted under the alias of 1562 Pte Jack Hart. An Irish migrant from County Tyrone, Ireland, Pte Daly had been working in Australia as a labourer for three years before enlisting in December 1914, and left Australia for Egypt with the 3rd Reinforcements in February 1915. 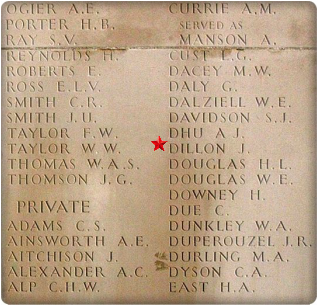 Arriving on Gallipoli on 30 April 1915, Pte Daly was evacuated from the peninsula to Alexandria with dysentry, and remained in Egypt where he transferred to the 57th Battalion as part of the 'doubling-up' of the AIF in February 1916. He arrived in France for service on the Western Front in June 1916, where he became a bomber attached to the Headquarters of the 57th Battalion. 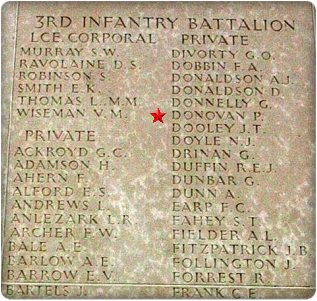 According to his Red Cross Wounded and Missing file, Pte Daly was one of three men killed by German artillery which landed in the shell hole he was taking cover in after the attack on Polygon Wood on the 27 September 1917. 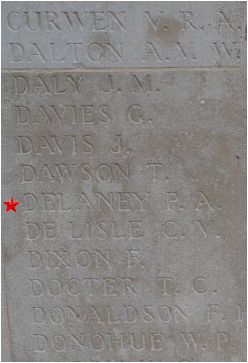 Despite attempts by the Red Cross to determine where Pte Daly was buried, the location of his grave remains unknown. 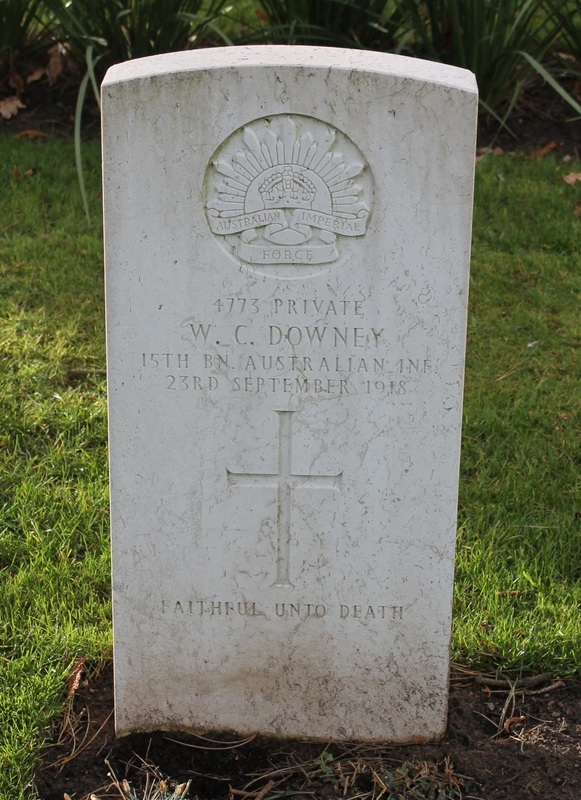 Pte Daly was aged 27 at the time of his death. Husband of Norah Deevy, 70 Gladstone St., Rockhampton, Qld. Embarked: 30-12-1915, Brisbane Queensland per "Itonus"
Embarked: 23-11-1915, Sydney N.S.W. 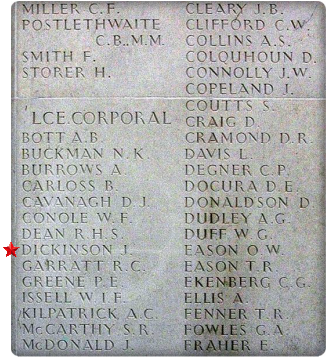 per "Suffolk"
Embarked: 16-7-1915, Melbourne Victoria per "Demosthenes"
Embarked: 16-12-1916, Melbourne, Victoria per "Medic"
Husband of Mary Devlin, McIlwraith Avenue, National Park, Cooparoo, Qld. 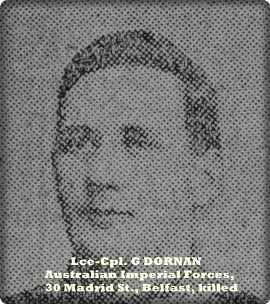 Embarked: 30-12-1915, Brisbane, Queensland, per "Itonus"
Son of Robert and Eliza Jane Dickson, of Ballymaconallan, Gilford, Co. Down, Ireland. Husband of Eva Digges-La Touche, of The Rectory, Miltown, Co. Kerry, Ireland. Embarked: 2-11-1915, Fremantle Western Australia per "Ulysses"
Son of John and Alice Doheny, of Callow, Co. Kilkenny, Ireland. Embarked: 30-3-1916, Queensland per "Star of Victoria"
Embarked: 10-10-1916, Fremantle, Western Australia per "Suffolk"
Embarked: 3-11-1916, Sydney, N.S.W. per "Afric"
Embarked: 24-1-1917, Sydney N.S.W. per "Ayrshire"
Next of Kin: Mick Donnellan, Culcally, N.S.W. Enlisted: 20-9-1914, Rosebery Park Camp, N.S.W. Embarked: 1-6-1916, Fremantle Western Australia per "Warilda"
Son of Daniel and Catherine Donovan. Embarked: 12-5-1915, Sydney N.S.W. per "Themistocles"
Embarked: 13-4-1915, Sydney N.S.W. per "Lyarra"
Died: 27-9-1916 on board H.S. 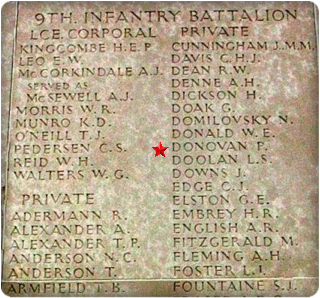 "Kanowna"
Embarked: 8-4-1915, Brisbane, Queensland, per "Star of England"
Lance Corporal Michael DOOHAN 2590 M.M. Son of William and Catherine Doohan. Husband of Fanny Doorly, 49 Whaling Road, North Sydney, N.S.W. Son of James and Minnie Dornan. Next of Kin: Brother - J. Dornan, South Terrace, Fremantle W.A. Embarked: 6-6-1916, Fremantle, West. 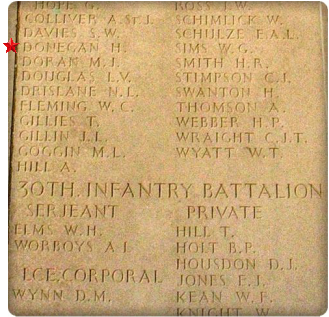 Aust per "Suevic"
Embarked: 1-5-1916, Brisbane, Queensland per "Clan Mc Gillivray"
Son of James and Annie Douglas. Enlisted at Kensington 3/9/194 with 1st Battalion with Service No. 197. Did not leave Australia with AIF. 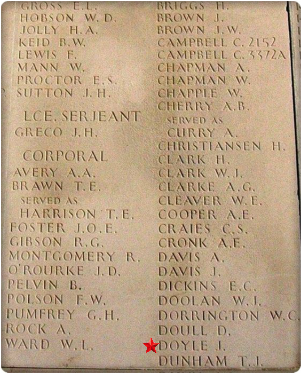 Re-enlisted at Rosehill 28/10/1914 with 1st Battalion with Service No. 1124. Embarked: 17-6-1915, Brisbane, Queensland per "Borda"
Private William Clarence DOWNEY 4773 M.M. Embarked: 28-3-1916, Brisbane, Queensland per H.M.A.T. "Commonwealth"
Next of Kin: Mr. W. Moore, Grafton, N.S.W. Embarked: 31-3-1916, Sydney, N.S.W. 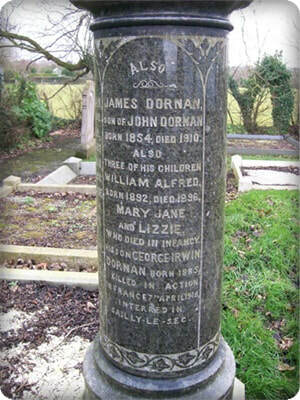 per "Star of Victoria"
Son of William and Catherine Doyle, of Upper Main St., Graiguenam lnagh, Co. Kilkenny, Ireland. Embarked: 31-3-1916, Sydney, N.S.W per "Star of Victoria"